Lipomyelomeningocele, a closed neural tube defect, usually occurs in lumbosacral area as a single lesion but can be associated with other spinal dysraphism. We report an infant with a very rare presentation of tandem lumbosacral lipomyelomeningoceles, thick filum terminale and split cord malformation. Since 2008 we have operated 115 patients with LipoMMC in our department and only one of them had two LipoMMCs at the same time (about 0.87%). Here we report the infant who presented with lumbosacral soft tissue mass which his spinal MRI and surgical intervention confirmed two separate kind of lipomas; distal and dorsal types associated with split cord malformation. A three month old male infant presented with a congenital skin covered soft tissue mass in midline lumbosacral area. There were multiple cutaneous hemangiomatous skin changes over the soft tissue mass. Neurologic examination was intact especially in lower extremities. Thorough urological evaluation confirmed detrusor sphincter dys-synergy with high pressure bladder according to urodynamic study. Spinal MRI confirmed SCM type II associated with low lying conus and lipomatous stalk coming from spinal canal defect to the spinal cord and attached to the cord dorsally [Figure 1]. Surgical procedure was done in prone position with an elliptical incision. There were fascial and bony defects at L4 to S1 levels through which lipomatous tissue was invaginating from surface to the dura mater through that defect. Laminotomy above the defect was performed and normal dura mater was exposed and incised. There were two dural defects separated from each other with normal dura mater. The dorsal type lipoma was separated carefully from the neural placode in the spinal canal and then pial edges approximated by 6-0 non-absorbable sutures. Another lipomatous tissue as a distal type lipoma was in continuity with a short right hemicord exiting through a different dural defect in a more caudal and lateral location of the spinal canal. After durotomy and sharp cut of the lipomatous tissue, the cord was released. 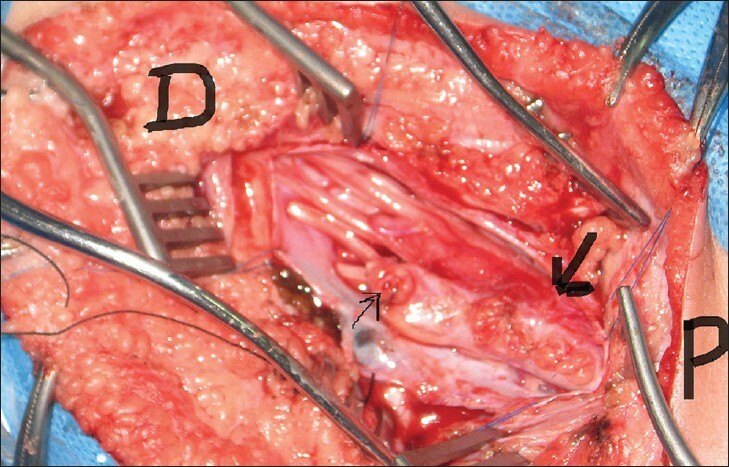 The left hemicord that was separated from lipomyelomeningoceles and right hemicord had a thick fatty filum terminale that was divided from the attachment to distal dural pouch [Figure 2]. Closure was performed in layers. Postoperative period was uneventful. Disturbances in the sequence of events of secondary neurulation (between postovulatory day 25 and 48) can lead to lumbosacral lipomas. , The development of SCMs as a result of persistent accessory neurenteric canal, during third week of embryogenesis, has been explained so far. , Further development of various dysraphic entities in conjunction with SCMs were seen in the literature, but two secondary neurulation errors in a case of previous defective gastrulation is a very rare condition. Association of several embryologically different dysraphic lesions in one case as described in our patient is very rare. Double spinal lipomyelomeningocele have been reported before. ,,, All previous reports were female and lipomas were located in lumbar or sacral regions [Table 1]. Two patients reported before had cloacal extrophy and one of them like our patient had SCM II. The probable pathogenesis for this rare association can be genetic basis that has the potential of involving different embryologic phases or being exposed to multiple teratogenic factors at different time. Good quality spinal MRI can discover multiple lesions in one patient but MRI in a young infant especially without a high quality MRI like this one may miss the multiple lesions and MRI findings become inappropriate to the surgical findings. The importance of knowing multiple lesions in one patient is the correction of associated lesions at the same surgery. Ignorance of the accompanied malformations and performing the first surgery without correction of all lesions will result in the patient undergoing another surgery. Late surgery inside the previous operative adhesions and scars increases the risk of damage to neural tissue and complications. Multiple neural tube defect anomalies in one patient are very rare that can be detected with a good quality spinal MRI or during precise surgical exploration. Awareness of accompanying lesions in a known case of lipomyelomeningocele is important to correct associated lesions at the same operation which prevents from another surgery which is more risky in the presence of previous operative adhesions. 1. McClone DG, Naidich TP. Terminal myelocystocele. Neurosurgery 1985;16:36-43. 2. Rajpal S, Iskandar BJ. Lipomyelomeningocele. In: Winn HR, editor. Youmans Neurological Surgery, 6 th ed. Philadelphia: WB Saunders; 2011. p. 2211-8. 3. Sarris CE, Tomei KL, Carmel PW, Gandhi CD. Lipomyelomeningocele: Pathology, treatment, and outcomes. Neurosurg Focus 2012;33:E3. 4. Pang D, Dias MS, Ahab-Barmada M. Split cord malformation. I. A unified theory of embryogenesis for double spinal cord malformations. Neurosurgery 1992;31:451-80. 5. Pang D. Split cordmalformation. II. Clinical syndrome. Neurosurgery 1992;31:481-500. 6. Endo T, Yoshida Y, Shirane R, Yoshimoto T. Tethered spinal cord with double lipomas. Case illustration. J Neurosurg 2001;95 Suppl 2:277. 7. Gorey MT, Naidich TP, McLone DG. Double discontinuous lipomyelomeningocele: CT findings. J Comput Assist Tomogr 1985;9:584-91. 8. Salunke P, Futane SS, Aggarwal A. Split cord malformation Type II with twin dorsal lipomas. J Neurosurg Pediatr 2012;9:627-9. 9. Kim MJ, Yoon SH, Cho KH, Won GS. Tethered spinal cord with double spinal lipomas. J Korean Med Sci 2006;21:1133-5.